Every once in a while, two of my favorite things about summer collide. Hubby likes to grow herbs. Though he doesn't really like to cook, there is one herby recipe he really enjoys making. Last night, I lucked out. 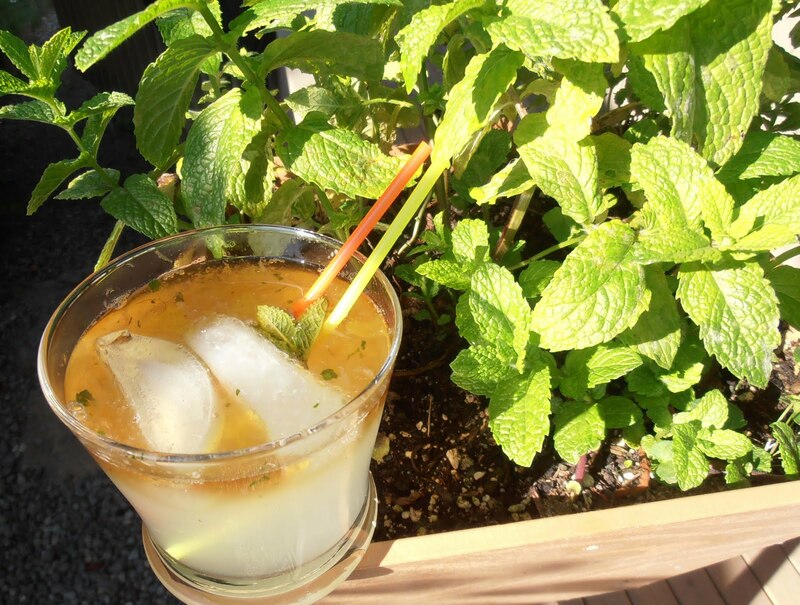 Me: "Is it ok if I post your mojito recipe on my blog?" 90 seconds pass . . .
Hubby: "Does that mean you want one tonight?" Me: "Do you feel like one?" Hubby: "I'll go pick some mint." Tear 15 or so mint leaves into a cocktail shaker. Add 2 oz. simple syrup. Cut 1 lime into 1/8's - squeeze juice into shaker and then toss in lime wedges. Muddle together. Pour 4 oz. rum into shaker; fill 1/2 full with ice and shake vigorously until shaker is very cold. Divide into two glasses; top off with Sprite. Add float of 1/4 oz. dark rum to each glass. Summer in a glass. Enjoy! How did you know I had all kinds of mint in my garden and needed something fun to do with it? Sounds fabulous! Oh how you tempt this pregnant lady! I love mojitos, but we always use a mix, which doesn't make sense because we always have fresh mint growing! Will have to make some next summer for sure! Looks delish! Also sounds like you had a good evening! I can't tell you how many times I've heard similar conversations over the years. As they say here in Minnesota, "Oh for cute!"